Check templates let you set up a layout for printing student refund checks right from Populi. After setting up the template, you can use it to print individual credit balance refund checks or a batch of checks on Billing > Current > Student Balances. Click Add a Check Template. Give the template a name—the check paper type would be a good move. As soon as you save, you'll be taken to the template editor page. Page layout refers to the overall dimensions of the check sheet and the size and arrangement of the individual checks. You can usually get these dimensions from the check manufacturer. These dimensions determine where exactly your printer will lay down the ink. Fields are the blocks of information included on each check. These items have to be arranged so that they fit on one, single printed check. Click edit next to Page Layout. Enter or edit values for the fields you need to change. The cell width and height determine the overall dimensions you'll be using for your check fields. If this is a template for a single check, make sure to check one cell per page (leave unchecked if this is a sheet of checks). check fields let you specify the check's content and appearance. Click add next to Fields. Choose whether this is a Text or Background Imagee field. You can only have one image field per check template. Enter your content. You can include variables like check number, payee name etc. You can also type text. Format the content with font size, color, and alignment. Enter the width and height in inches; you can use up to four decimal places (e.g. 1.6225). Make sure these fit inside the cell width/height! Likewise, enter top and left position in inches (up to four decimals...). These fields will probably take some finessing—as you work with the template, scroll to the bottom of the page to see the preview. You'll see the field in the preview at the bottom of the screen. If you need to adjust a field, hover over it and when you see the blue highlight, click it. As you save your check fields, you'll see a preview at the bottom of the screen. Provided your monitor is not set up with some strange configuration, the preview is roughly the size of the actual printed check. The preview will help you make tweaks and adjustments to your check fields and their positions relative to one another. Click Print Preview to test your check template with some sample data. 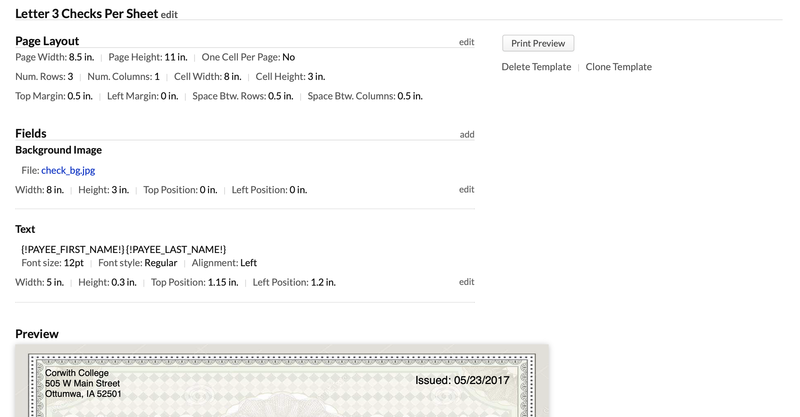 Clone template lets you create a new check template based on the one you're working with.